The Halona blowhole is about a 10-15 minute drive south of Waikiki along scenic highway 71. The drive through the mountains is simpy jaw dropping. Here are directions. In between the cliffs there is a small cove that you and the family can hike to. This is a great place for the kids to play and parents to enjoy the scenery. Pictured above is the path that leads down to the Halona Blowhole Cove. Exercise caution and watch the kids closely because the path isn't paved. There are also mini lots to park with various view points of the Pacific. On a clear day you can see the surrounding islands of Molokai and Lanai. Winter time visitors can spot Humpback Whales during their migration from the Artic Sea. Here is the blowhole in the summertime. As you can see the waves are not high, hence why there is not much action going on there. 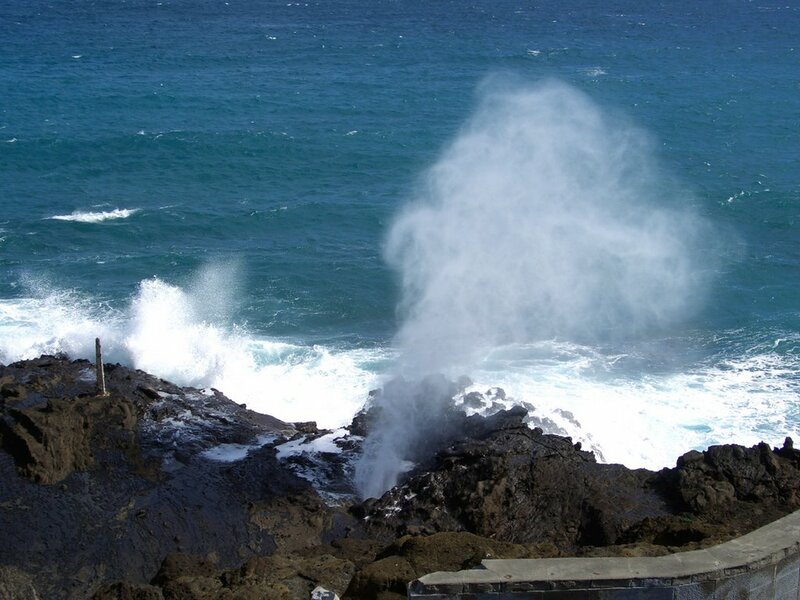 Another picture of the blowhole in the winter time when the surf is higher provides a geyser like effect that provides visitors an entertaining spectacle of nature's raw power. The Halona Blowhole is highly recommended to add to your list of things to do with family in Oahu. Looks like a great view. Hopefully our family will spot some whales when we visit during winter vacation.